A number of fossilised footprints believed to belong to a hominid ancestor of modern humans have been stolen from Kissamos on Crete, by a person or persons unknown, authorities revealed on Thursday. 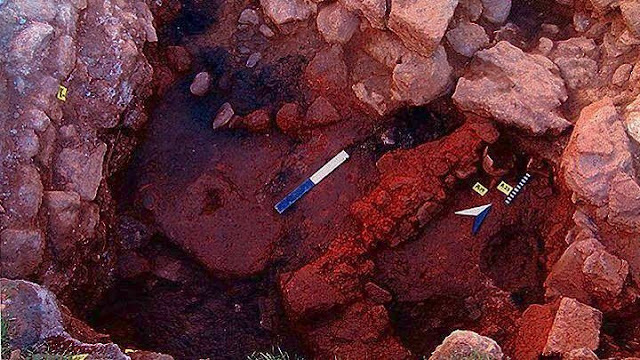 Ten of some 40 footprints on the Kasteli site have been cut away and removed from the rock, where they were found by a Polish paleontologist in 2002. The theft was reported by a member of the public that visited the site on Tuesday and alerted local police, and was later confirmed by the Natural History Museum of Crete. Police and scientists are now investigating the case, while Kissamos Mayor Thodoris Stathakis, in statements to the Athens-Macedonian News Agency, said it raised an issue of protecting cultural heritage sites in the area. "The issue of showcasing but also protecting antiquities that exist in the region must be dealt with directly," he said. In an announcement issued on Thursday, the Natural History Museum of Crete confirmed the theft and was sharply critical of those responsible. ".. Following information we received, a member of the research team, Charalambos Fasoulas, visited Kissamos on Wednesday and carried out an inspection. This confirmed that at some time, probably at the beginning of the previous week, unknown individuals acting selfishly and without conscience had proceeded to destroy and remove from the archaeological site sections of rocks that included 10 footprints out of a total of 40 that have been studied. Mr. Fasoulas went to the police station in the area and reported the incident, providing all information possible," the announcement said. The announcement also noted that the entire site and the footprints found have been accurately measured and recorded by research teams using laser techniques, so that every part of it is immediately identifiable and recognisable. As a result, it added, it would be impossible to attempt to sell the footprints without this being immediately detected. "Consequently, if anyone thought that they could profit from this act they are out of luck. The Museum unequivocally condemns this action, which is shameful for our country and for all of us. It accepts the share of responsibility that probably belongs to it and calls on all the agencies and services involved to take immediate action today to protect the site and the fossils from possible similar destructive actions, as well as to take the necessary action to showcase the finds, which was the desire of the entire research team." Thanks for this. I assume these are the footprints of Trachilos >5.6 Ma? These footprints are coastal: they occur in a very brief emergent episode in an otherwise shallow marine sequence, something like a small stream delta right on the shore, according to professor Per Ahlberg: the prints are quite disorganised, the surface densely trampled, perhaps these late-Miocene hominoids were foraging, e.g. for cray- or shellfish? The Trachilos footprints seem to confirm the aquarboreal theory that Miocene hominoids lived in mangrove/swamp/flooded forests, where they frequently waded bipedally & climbed vertically, arms overhead, in the branches above the water, and probably a diet including palmnuts & shellfish such as mangrove oysters (cf. thick enamel of most Miocene hominoids, and the stone tool use still seen in extant great apes). Google e.g. "aquarboreal ancestors 2002 TREE".